Such a strange arrangement of circumstances, when similarity repeated refuses to become tedious, instead becomes all the more enthralling. Welcome to Sayta where days and nights roll together in a barely perceptible tidal ebb and flow, the hypnotic rhythm predictable and all the more entrancing for being so. There is asado for lunch every day so far yet, we look forward to our lunchtime binge at the hands of the unobjectionably invasive hospitality. Horse riding is the pastime rolling on a every high tide so welcomely; far from a tempestuous ocean this captured lake gently rolls with history granting little in the way of surprises. We have learnt a great deal about the subtlety of the life here from our short visit; so much more we don’t know a welcome distance from a yearning for information. We’ll take what we know as a treat and fret little of what we miss. Maybe we’re learning more than we know. One such theme here is the gaucho, the horsemen. Or so we thought. Gaucho it seems is more of a cultural segment of society, similar to how we might term farmers, a demographic that denotes an all encompassing lifestyle from birth onwards. The gauchos here are exponents of the simple life, the masters of the art we so fleetingly glimpse. Ever so polite, a gaucho finds it distasteful to touch a woman even to help her on her horse, old fashioned propriety instilled in a culture of ever such over-brazen machismo. So what’s the central theme to the gaucho lifestyle? The horse of course. They rustle cattle and sheep but everything is done form horseback, if you don’t ride it’s hard to call yourself a gaucho, actually basically impossible. Mostly applied to men it is however universal, the total community is gaucho, one does not become a gaucho. This ideal slips into the frame of what we see here, traditions are simple, firmly held and nurtured with no small slant of romanticism. 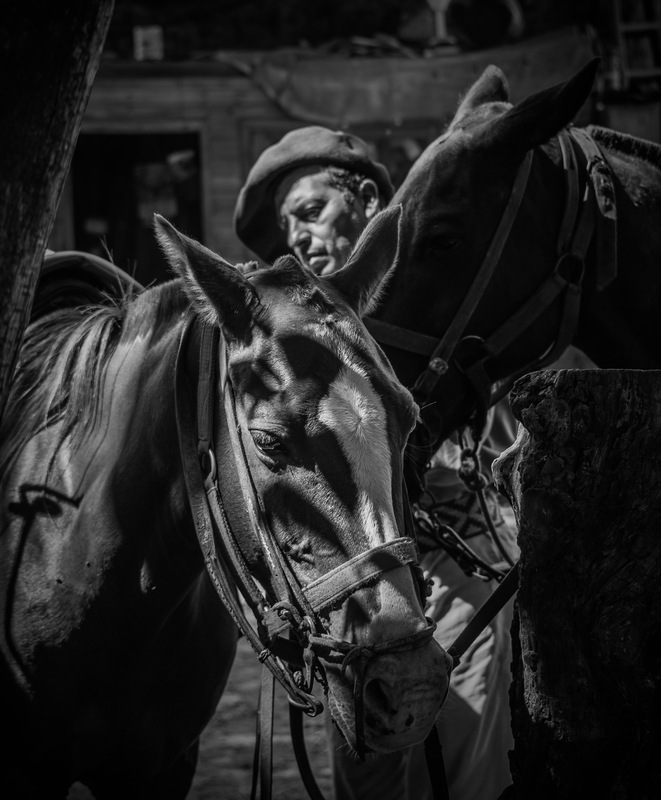 Evidenced by the endless work done with the horses; what might seem like playing and trickery forms part of being a gaucho, an expression of prowess akin to a university degree or a sporting ability. Not just riding but being skilled in all matters of horsemanship is a well of pride and identity, even to the casual observer this becomes obvious. The tilted beret, the fine cotton shirt, baggy trousers and the delicate small slippers seem to be the uniform, all suave cowboy dash hiding a calm, confident shyness that belies the latin stereotype. From all I can tell whether you’re a gaucho or not it’s the gaucho lifestyle that creeps it’s way into quite a bit around here. The open fire cooking reeks of everything outdoors and rural, the dress is functional with little acquiescence to fashion and all flavours in between. Today we even sit down to lunch at the table with three settings sporting an ornate knife similar to that we’ve seen tucked into the gauchos belts. It turns out that the locals here cut their meat with their own knife, beautiful and powerful stamps of identity utilised in the ritual that seems so central to life here, eating meat. I jokingly place Laura’s knife at my setting to tease, in good humour it is immediately moved; one does not use another’s knife. As a rare treat we’re offered to use one of Enrique’s (the father of the house) personal knives from his collection, can you guess the response? We gleefully eat our meat with beautiful dagger like knives dripping with history as much as the asado juices. This is a real treat, one was a gift to Enrique for his 60th birthday and the other was crafted by a friend as a gift many years ago. There’s not a single genetic marker of gaucho in us but for this lunch we feel a little slice of gaucho and we’re lucky for it. Not surprisingly as is the rhythm here we go for a short ride after lunch. It’s a similar route to g	our first ride but who really cares, when in Rome as they say. The large group that has been staying here all left before we even got up so the peace and quiet seems fitting, just right. We’ve gotten to know the guys working here now so it feels more like hanging out with mates, not that they ever felt like ‘staff’ at all. We hang about and chat, or not chat, as the will takes; the rhythm of the lifestyle here is the only signpost anyone needs. Life’s propriety needs no etiquette books or social rules, it seems like it takes you on a ride and guides you gleefully to all that nourishes, if you realise it or not. Who could have imagined a little nap after riding followed by wine before dinner? I swear I never saw that one coming: OK, I lie, we knew exactly what was coming and we buzzed gleefully towards it as moths to a flame. So what are the words an outsider might put to being a gaucho? I start with the term adrenaline junkie; our lives so often crammed by the pursuit for disturbance of the norm as a lift, an elevation. Be it an adrenaline junkie or otherwise we all seek these welcome disturbances, the new highs to disrupt the mundane. Winston Churchill famously said: ‘the best thing about being right is that you never have to apologise’. 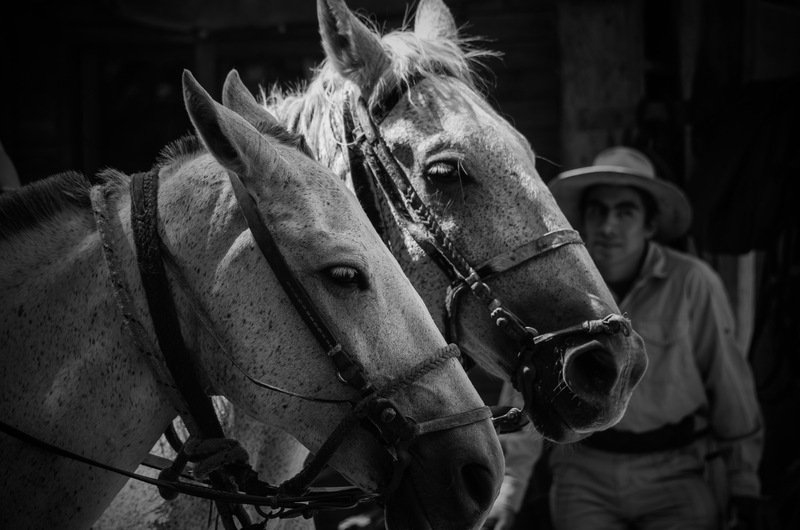 From the fleeting observer it seems like the gaucho lifestyle soundly boasts the luxury of being right, life is not at all tedious, therefore needs no disturbance. Famous words from a giant of history, from a culture so opposed, laid perfectly upon those who need not make any apology. Salud! I’m amazed, I must say. Rarely do I come across a blog that’s both educative and entertaining, and without a doubt, you’ve hit the nail on the head. intelligently about. I’m very happy that I stumbled acrross this in my hunt for something concerning this. Thanks Lucretia. That’s exactly what we were aiming for. And we wanted to replicate how we travelled…to be educated and entertained. Wow what a comment, thank you for taking the time. The excellent adventure as we’ve taken to calling it has come to an end; but not really. We’re back in Australia and value the lives and fortune we have like never before. The excellent adventure has given us the perspective to make an excellent adventure of everyday life.